Description: A rare anti-North satire, probably dealing with either the Crittenden Compromise or the Douglas Compromise. Proposed in December 1860 in the form of several constitutional amendments, the former called for restoration of the Missouri Compromise line and prohibition of slavery north of it. Stephen Douglas’s compromise, an alternative proposed immediately thereafter, offered two similar amendments but also advocated settlement of the slavery issue by popular sovereignty. “Congressional Surgery” reflects the viewpoint of the lower South, which rejected both compromises. 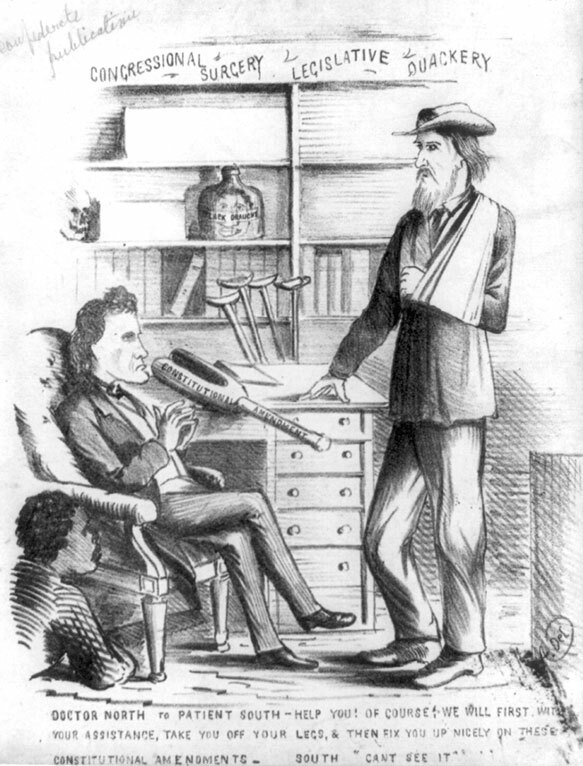 “Doctor North” (Pennsylvania congressman Thaddeus Stevens) sits with hands folded in a chair at left, a young black crouching beside him. On the doctor’s desk rests a wooden leg labeled “Constitutional Amendment.” The Doctor says, “Help you! Of Course! We will first, with your assistance, take you off your legs, & then fix you up nicely on these Constitutional Amendments.” His patient “South,” a tall bearded man with his left arm in a sling, replies, “Can’t see it.” Behind the desk are several crutches and bookshelves holding a bottle of “Black Draught” and a skull.